Over the past few weeks Yutao Wang’s F30 BMW 328i has been making quite the transition from a standard spec 328i over to the full M-Sport appearance package. Of course, with the stock wheels and ride height, the full BMW 328i M-Sport Conversion looks a bit off – unfinished. With a little help from the Mod Experts, we solve that problem. At ModBargains, everyone from the top down is here to help our customers, including our founders Mike and Ron – and co-founder Mike Brown recommended some of the tweaks that helped shift Yutao’s vision from dream to reality. 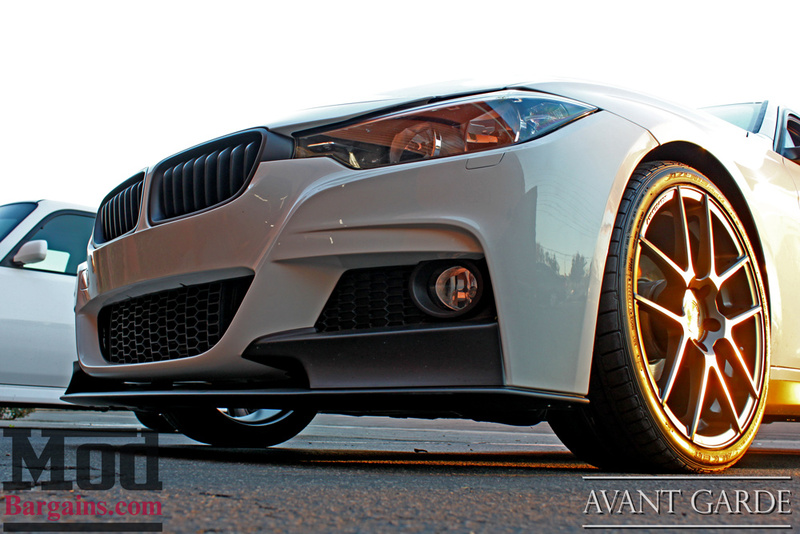 A few weeks back we started off with the exterior upgrades – an BMW F30 M-Sport Style Front Bumper reshaped the nose of Yutao’s 328i, but it took a few more elements to give it the look you see here. Some of these upgrades are so clean and subtle you’d never notice otherwise, like the Matte Black Kidney Grilles for BMW F30 which tie in nicely to the matte black aesthetic created by the ABS plastic Performance Front Splitter for Msport F30 models. Out back, a wee little ducktail spoiler adds some visual interest along the hipline of the car. Opting for a Carbon Fiber Performance Style trunk spoiler for BMW F30, the carbon along the upper hipline ties in nicely with the Carbon Fiber mirror covers for BMW F30. 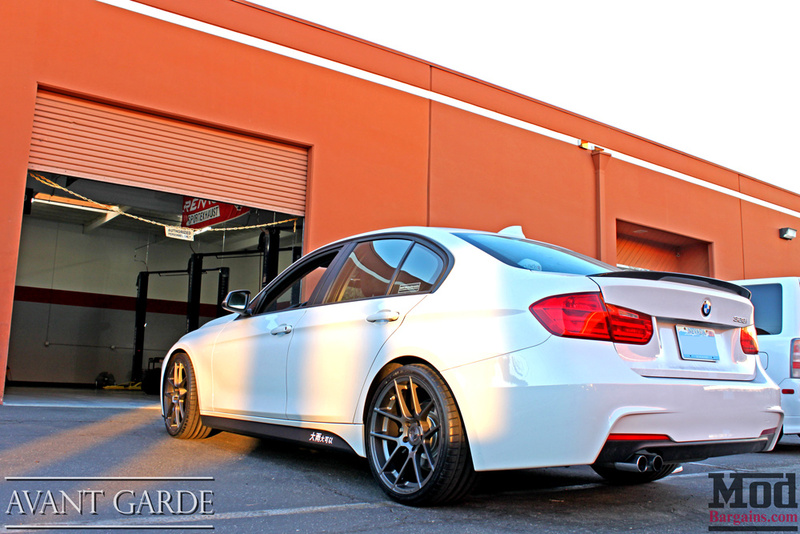 The CF trunk spoiler is an excellent compliment to the M-Sport Style Rear Bumper for 2012+ BMW 3-Series [F30] and M-Sport Style Side Skirts for 2012+ BMW 3-Series [F30], but what really sets the car off is a subtle drop courtesy of a set of Eibach Pro-Kit Lowering Springs for BMW F30 3-Series, offering a 1.0in drop up front and a subtle .6in drop in the rear. 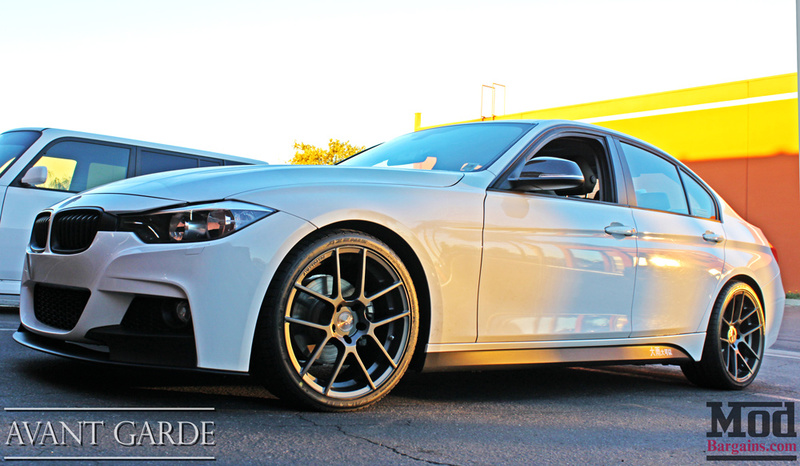 But what really gives the car the finished aesthetic it deserved is a set of Avant Garde M510 wheels for BMW, spec’d out by ModBargains Co-Founder Mike Brown himself at 19×8.5 et35 in front, 19×9.5 et40 and the wheels are finished in a handsome shade of dolphin gray. The rubbers wrapping the wheels are Falken Azeni FK-453, 235/35-19 up front, 265/30-19 in the rear. After all, just because the N20 is a four banger, doesn’t necessarily mean it’s a slouch, afterall, it has is a tuner friendly turbo four, so some extra meat at the rear definitely helps. With a little help from the Mod Experts at ModBargains, Yutao has turned a boring F30 328i into an aggressive and exciting machine all his own, and we look forward to seeing what mods he does next. A big thank you to Yutao for letting us share the transformation of his handsome F30, and shoutout to ModBargains Co-Founder Mike Brown for recommending the mods that helped Yutao’s build come out so nicely. 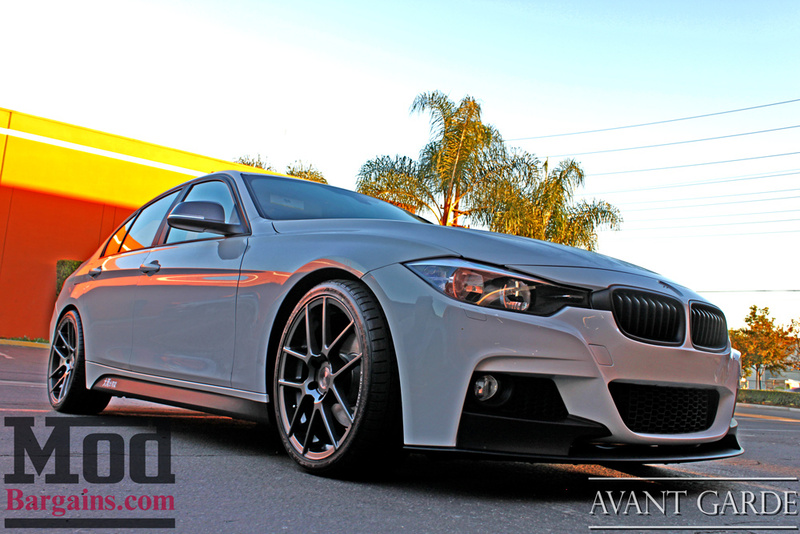 Interested in getting a set of Avant Garde M510 Wheels for your BMW? Need to get your next mod installed? Give the Mod Experts at ModBargains a call at 714-582-3330 today! Want to know how to get more power out of your N20 328i? Check out our guide to N20 Bolt On Mods here!